2009 Division Winners: Florida State won the Atlantic & North Carolina won the Coastal. 2009 Champion: Virginia defeated Florida State 6-3 to capture their 3rd ACC championship and first since 1996. 2010 No Easier: The ACC has three teams in the top 10 and six teams ranked in the top 16 in Collegiate Baseball’s “Fabulous 40” Preseason Poll, the most by any conference in the country. Virginia leads the way ranked 3rd, followed by Georgia Tech at number 6, and Florida State 7th. Miami starts the year ranked 12th, while North Carolina checks in at number 13 and Clemson begins the year 16th. Premier Players: 11 ACC players find themselves on the Louisville Slugger pre-season All-America teams including a conference high four 1st teamers. Those on the first team are RHP Deck McGuire from Georgia Tech, C Yasmani Grandal from Miami, OF Jarrett Parker of Virginia, and OF Tyler Holt from Florida State. 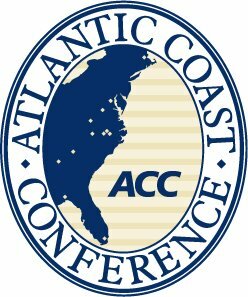 *We will preivew the ACC’s Coastal Division and make our predictions for overall conference winner, Player of the Year and Pitcher of the Year tomorrow. History Made: BC’s 25-inning NCAA Regional loss to Texas last year was named the #1 collegiate baseball game to remember for the past decade by the Yahoo Sports blog Destination: Omaha. It also ranked fourth on the Collegebaseball360.com “Top Moments of 2009” list. The game lasted an NCAA record 7 hours and 3 minutes, saw 683 pitches thrown, and 171 official at-bats. Eagles Lost, Return : Boston College deals with the loss of C Tony Sanchez (.346, 14 HR, 51 RBI) who was selected 4th overall in the 2009 MLB draft by the Pittsburgh Pirates. BC does welcome back Sr. OF Robbie Anston who finished second on the team with a .344 BA and stealing a team-high 15 bases. Battle of Boston: The Eagles play an exhibition game against the Red Sox March 3rd down in Fort Myers, FL. pitchers from 2009, including Jr. LHP Casey Harman (7-3, 3.95 ERA, 1 SV) and So. LHP Chris Dwyer who led the team with 95 Ks, becoming the first freshman to lead the Tigers in strikeouts since 1997. Back Among the Elite: Clemson’s 44 wins last year was a 13-game improvement, third best in school history. They also made their 22nd NCAA tournament appearance in the past 23 years and their 8th trip to a super-regional. Passing Parker: Tiger outfielder Kyle Parker is also Clemson’s starting quarterback. He threw 20 touchdown passes while helping Clemson beat Kentucky in this season’s Music City Bowl. Parker hit 12 home runs with 52 RBIs on last years Super Regional team as well. CLICK HERE to see more two-sport college baseball players in the Collegebaseball360.com Two Sport Reports. Home Sweet Home: The Tigers play 22 of their first 30 games at home and don’t leave the state of South Carolina until game 16 – a one game battle against Charlotte in North Carolina. Teams. Jr. OF Tyler Holt (.401, 87 R, 34 SB) is a first team selection. Jr. OF Mike McGee (.379, 19 HR, 78 RBI) is on the second team, while So. LHP Sean Gilmartin, 2009 ACC Pitcher of the Year, (12-3, 3.49 ERA, 2 CG) and Sr. SS Stephen Cardullo (.376, 10 HR, 20 SB) are third-teamers. Record Breakers: The Seminoles advanced to their 9th Super Regional in school history by beating Ohio State 37-6 in the Regional Championship. FSU set school records for runs (37), hits (38), doubles (15), and total bases (66) in one game. Schedule Notes: FSU opens their season February 19th when they host Georgia State. They will also play the Philadelphia Phillies March 3rd in Clearwater. And in what could amount to an Atlantic Division Championship Series, the Seminoles travel to Clemson to wrap up the regular season May 20-22. New Era: Erik Bakich was named the 6th head coach in Maryland history in June after former coach Terry Rupp resigned. Rupp left after nine seasons despite leading Maryland to 10 ACC wins in 2009, the most since 1972. Need Some Offense: The .281 BA in 2009 was 11th in the league last year, and Maryland loses 3 of their top 4 hitters. They do return they top hitter in Sr. INF David Poutier who hit .321 with 14 doubles and 8 stolen bases. Young Foundation: Maryland returns just 18 players from a year ago, and has only 5 seniors on their current roster. Future Pack Attack: NC State’s incoming recruiting class is ranked 11th by Baseball America. It’s the 3rd highest ranked class in the ACC behind North Carolina (7th) and Virginia (9th). Key Returners: The Wolfpack hit a league-worst .266 as a team, but do return several of their top hitters from 2009. Sr. INF Andrew Ciencin (.308, 15 doubles, .481 Slg%), Sr. OF Drew Poulk (.266, 9 HR, 36 RBI), and Sr. INF Kyle Wilson (.265, 5 HR, 30 SB) will lead the offensive attack this season. Friendly Down the Stretch: If NC State can be in contention toward the end of the season, the schedule plays nicely in their favor. The last month of the season keeps the Wolfpack at home for 14 of their final 17 ballgames, including home series against ACC foes Boston College, Georgia Tech, and Duke. The only road trip is a three game series at Florida State May 14-16. 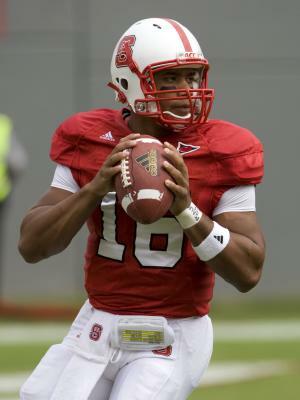 Double Duty: Wolfpack infielder Russell Wilson is also the starting quarterback for the NC State football team. He passed for an ACC-leading 31 touchdowns with 11 interceptions in 2009. CLICK HERE to see more two-sport college baseball players in the Collegebaseball360.com Two Sport Reports. Pitchers Returning: Several top pitchers return for Wake Forest this season, including standout So. LHP Zach White (4-1, 3.32 ERA, 3 SVs, .237 Opp. BA), So. LHP Austin Stadler (4-5, 4.13 ERA, 2 SVs), and Jr. RHP Ryan McGrath (3-1, 5.95 ERA, .236 Opp. BA). Offense Back: The Demon Deacons return speed and power to the lineup this season. Jr. OH Steven Brooks (.313, 30 RBI, 11 SB), Sr. C Mike Murray (.306, 6 HR, 37 RBI), and So. 3B/OF Carlos Lopez (.268, 12 HR, .562 Slg. %) all are back to lead the offense. Home Sweet Home: Wake Forest plays their first 13 games at home, and 34 of their 57 regular-season games at Wake Forest Baseball Park. ACC Atlantic Winner: Florida State, with Clemson right on their heels.